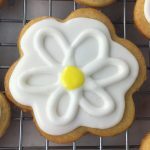 Royal Icing Daisy Sugar Cookies are traditional sugar cookies with royal icing decorations. I made these cookies because my 12 year old son absolutely loves frosted sugar cookies. It doesn’t have to be Christmas to make them either. 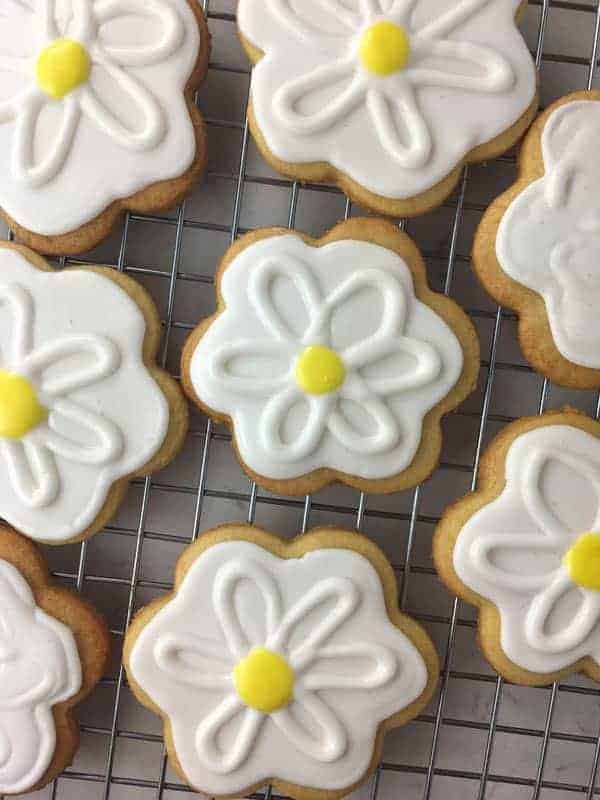 I thought these Royal Icing Daisy Sugar Cookies would be a perfect Summer treat. I used to have a cake and cookie business years ago. This was the cookie recipe I used, so it is tried and true. I’ve made literally thousands of cookies with this recipe. The cookies really don’t expand much at all during the baking process, so they hold their shape well. The Royal Icing Recipe I’ve included is also great! It’s very thick at first, but once you add a few drops of water, it turns into the right consistency. 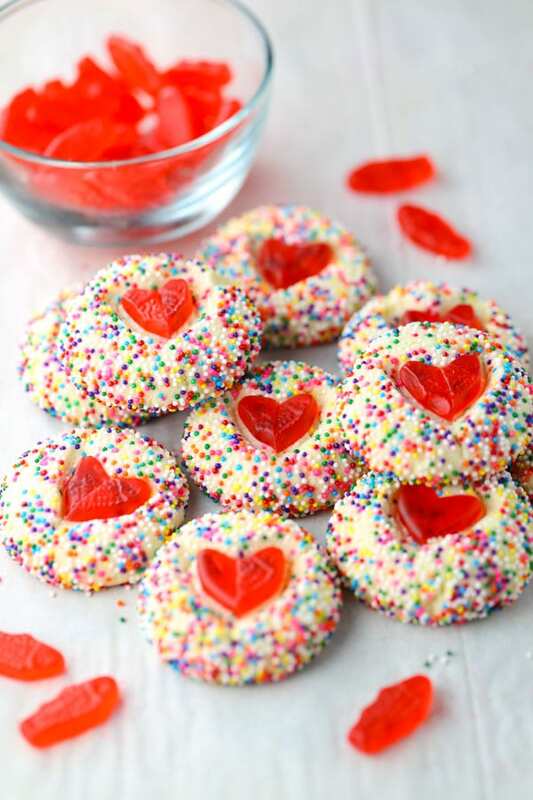 You will need to divide the icing into two bowls because you will need two different consistencies to decorate these cookies. First you need a thicker consistency for the outline and decorations on top. Then you need a thinner consistency to “flood” the middle (you can achieve this by adding more drops of water to the icing until it’s more soup than toothpaste). In other words, you’ll make an outline with the thicker icing (like the consistency of toothpaste), then you will add the thinner icing to fill in or flood the rest of the cookie inside your outline. Let that DRY! That will take about 10-30 minutes. Then you can add your final decorations on top. If you look at the photo just above, you’ll see the cookie on the bottom left is not quite right. That’s because I didn’t let it drive completely before I added the top decoration, so they melted into the flood icing. Oops! It still tasted good, but now you can see what I mean. 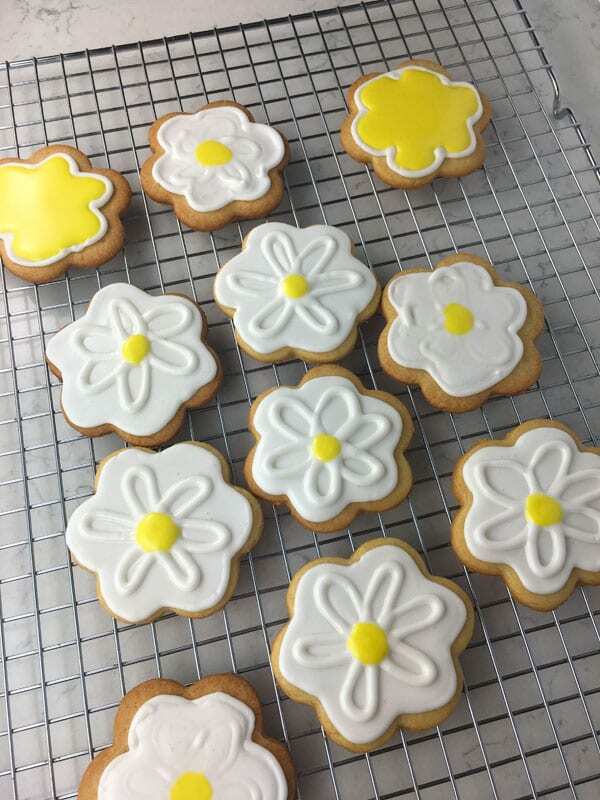 I hope you enjoy these Royal Icing Daisy Sugar Cookies! 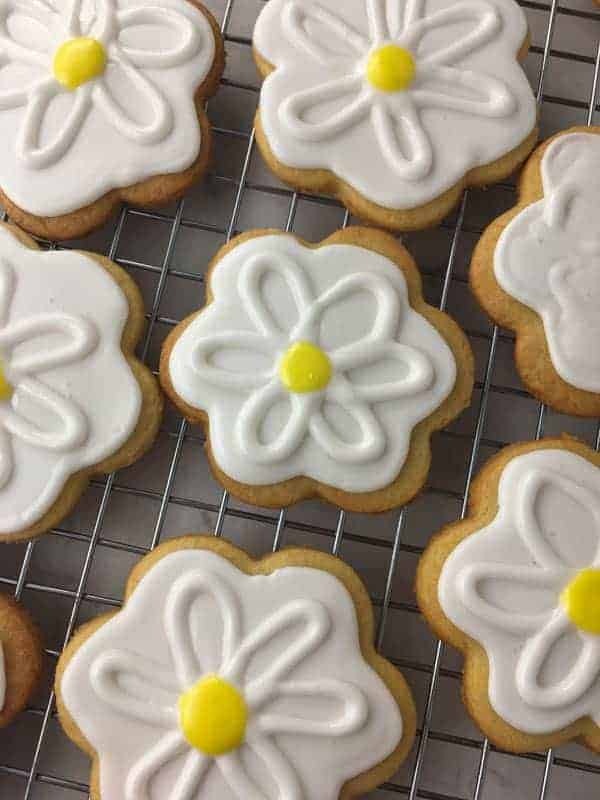 This sugar cookie recipe and royal icing recipe makes enough for about 4 dozen decorated 3-inch cookies. In a medium bowl, stir together flour, baking powder and salt. Set aside. You can weigh the flour on a scale for exact measurement, if desired. In a large bowl, add the butter and sugar. With an electric mixer, beat on medium for 3 minutes or until light and fluffy. Add the egg and vanilla. Beat on medium for another minute. Gradually add the flour with the mixer on low. Once it's combined. Turn the mixer up to medium and blend until the dough begins to pull away from the sides of the bowl. Take the dough out of the mixer and place on a piece of parchment paper. Knead the dough with your hands for about a minute. Wrap the dough in the parchment paper and refrigerate for one hour. Once it's chilled, unwrap the parchment and place on counter (you'll have the dough on the parchment paper). Place another sheet of parchment on top of the dough. Use your body to lean against the counter and hold down the two sheets of parchment on one side. Roll the dough through the parchment paper (so you don't need any extra flour). Roll the dough to about 1/8-inch thick (but slightly thicker, not 1/4-inch though). I cut them right on the parchment paper, then slide the parchment paper right onto a 13"x18" half sheet pan with raised edges. Bake the cookies for 8-10 minutes or until just turning golden brown on the edges. Let cool. Place all ingredients in mixer bowl. Turn mixer on low and let it mix for 6 minutes. Immediately transfer to an airtight container. Do not let it sit out for any amount of time or it will dry out. Store at room temperature for up to 3 weeks. Note: When ready to use for piping, you must add some water to it before putting it into pastry bag. Add a few drops of water at a time until it is of desired consistency which is like toothpaste. Not too thick and not too thin. Use this consistency to pipe the outline of your design, then use a thinned out version of the icing to flood the center. 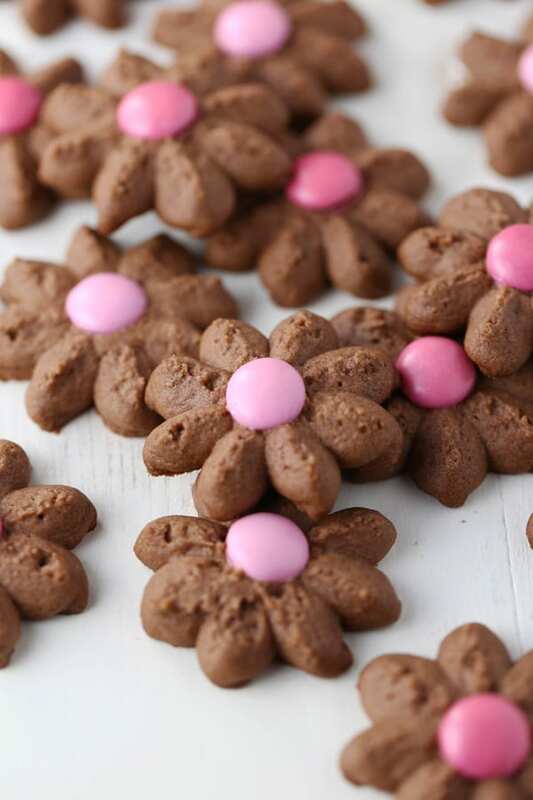 Let that dry on the cookie, then use more of the thicker consistency to pipe more decorations on top. Color about a 1/2 cup of royal icing with yellow food coloring. Place in a pastry bag with a #4 round tip. Place in a sealed plastic bag and set aside. Take the remaining white icing and divide in half. Keep half of it in the thicker consistency and add some water to the other half to make it of flooding consistency. Place some of the thicker white icing into a pastry bag fitted with a #4 round tip. Pipe the outline of the cookie. 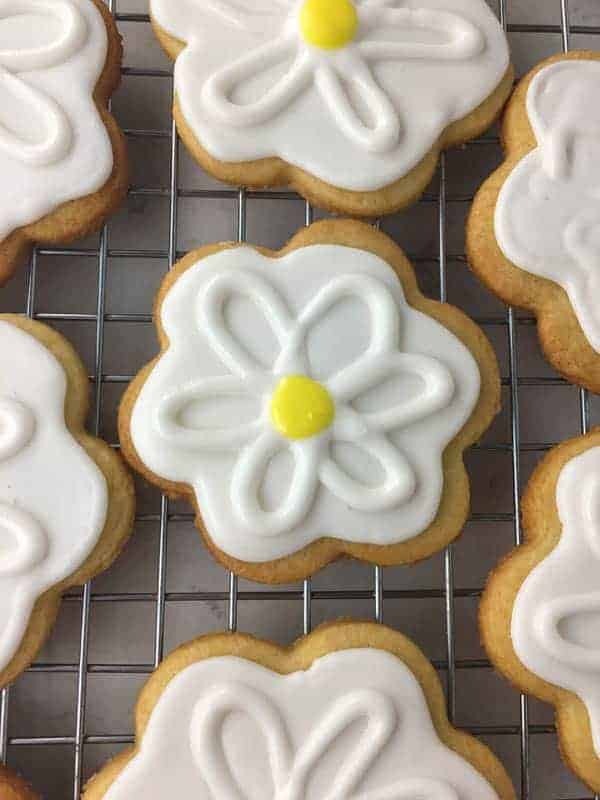 Then place some of the flooding consistency royal icing in another pastry bag (I use the disposable plastic ones), cut a small tip off the end to pipe the thinner icing into the center of your flower until it floods the entire inside of the outline. Let dry completely (about 30 minutes). Then pipe your flower design on top with your thicker white icing. Pipe a yellow center. Note: Keep your pastry bags under a damp towel or sealed in a plastic bag while you're not using them, so the tip doesn't dry out while your decorating the cookies. 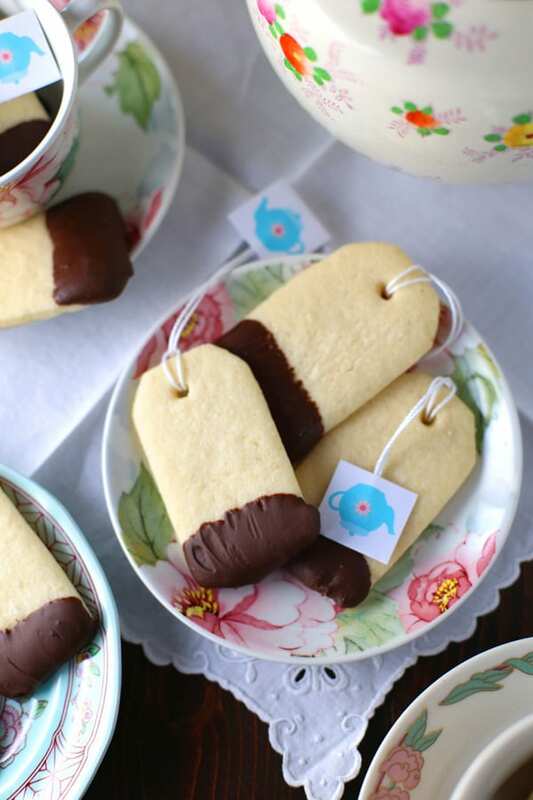 These Teabag Cookies are super cute too! Just an fyi….I’m not seeing where you’ve added the salt into your cookie dough. Debbie – It’s updated now. Thank you for letting me know. The salt is added with the dry ingredients.